Embarcadero ER Studio and Delphi - Felix John COLIBRI. Embarcadero purchased Codegear the 7th of May. As we understand it, Embarcadero is offering a range of database tools for design (entity relation), development (Sql IDE) and managment (dba tool, optimization, monitoring), "used by over 90 of the Fortune 100". 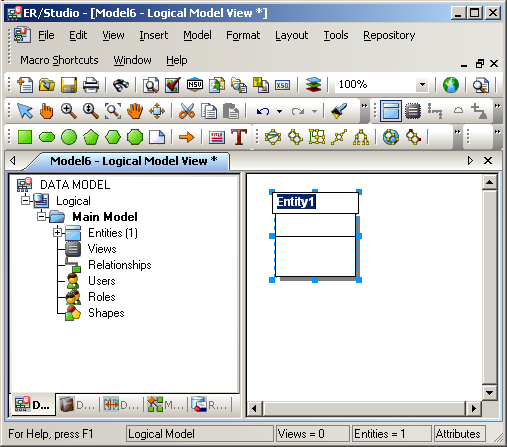 ER tools are similar to UML tools. 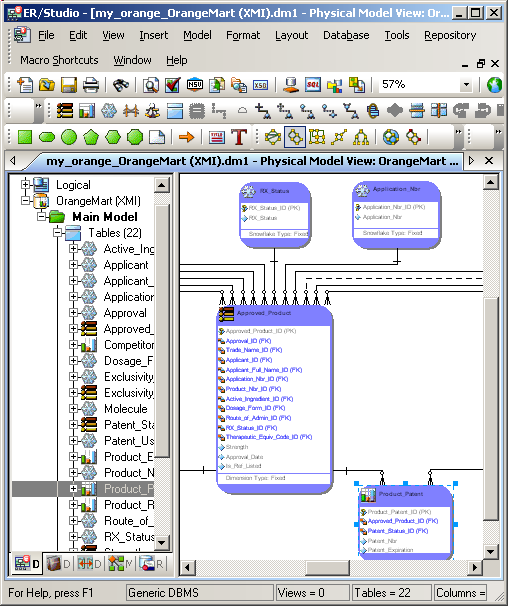 For UML, we try to organize our CLASSEs, by grouping attributes and methods and showing relations between those CLASSes. 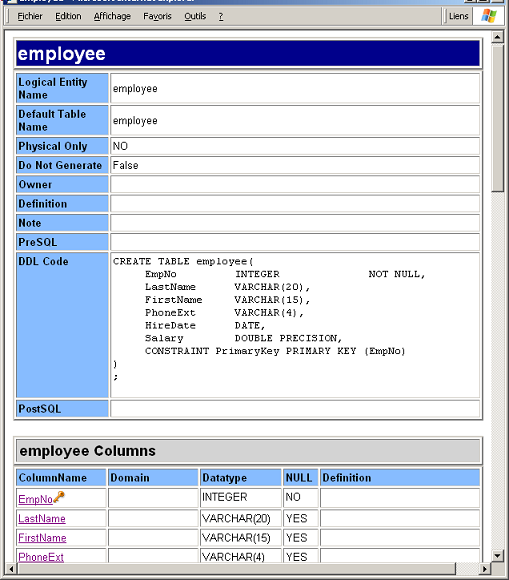 For database design, we try to group the data attributes into Tables, making relations between those tables explicit. The download is simple and no-nonsense: we just entered our name, phone, country and click. We could even save the page (which is usually not possible for Forms with ActiveX components). 9 minutes announced. It took us 35 minutes, because we are using a slow ADSL line (62K/sec). 2 minutes later the product was installed. A 21 Meg .EXE, a 44 pages QuickStart guide. 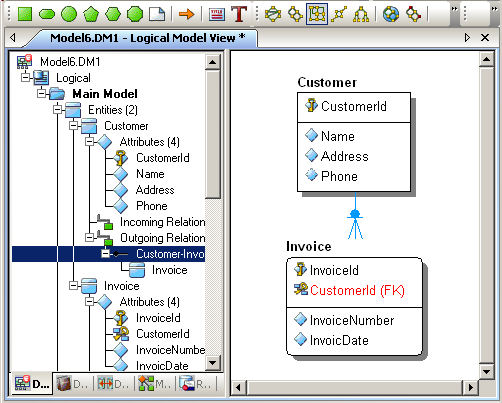 Lets build a simplified model, say a customer / invoice system. Before adding a relationship, we add the "Invoice" entity, whith "InvoiceId" (primary key), "InvoiceNumber", and "InvoiceDate" attributes. There are many many display properties we can change. 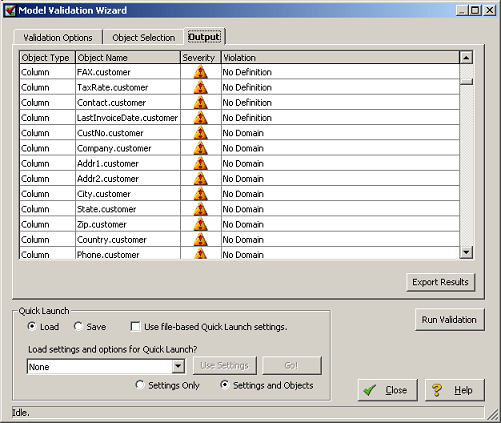 the selected icon will be automatically in "duplicate mode": each click in the Diagram Window will create a new item. 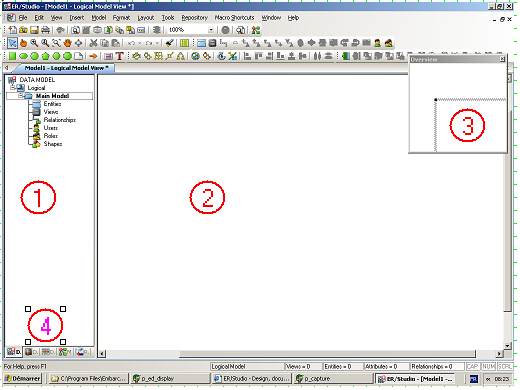 To stop the duplication, select the traditional "selection arrow"
the same goes for cursor selection: if you select the hand cursor or the resizing cursor, to get the simple cross-hair cursor, just click the "selection arrow"
the overall IDE is NOT based on the traditional "Palette / Object Inspector / Designer" metaphor. 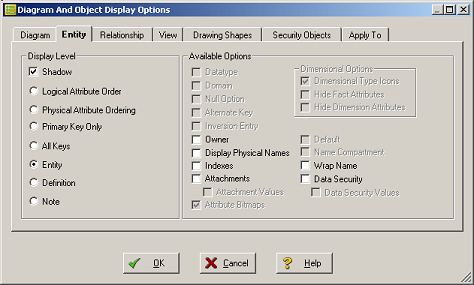 The Diagram Explorer lets you select (one or several) objects, and menus, toolbars and contextual menus allow us to initialize or modify values. This is rather efficient when we have to add many attributes to an Entity. This is not too disturbing, since the "one single entity attribute / one item in the Object Inspector" way of handling Together diagrams really is a pain. We do not have an ODBC driver for Interbase. There certainly are some available by looking at Google, but since we have the native Delphi connection, we have not looked at it. So let's try to use an Access example. 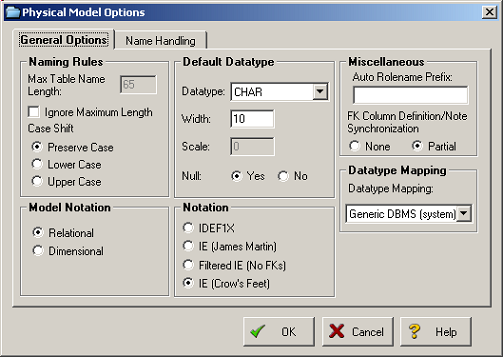 We will reverse the only Access database we have ever seen, which is the DBDEMO.MDB database shipped with Delphi. 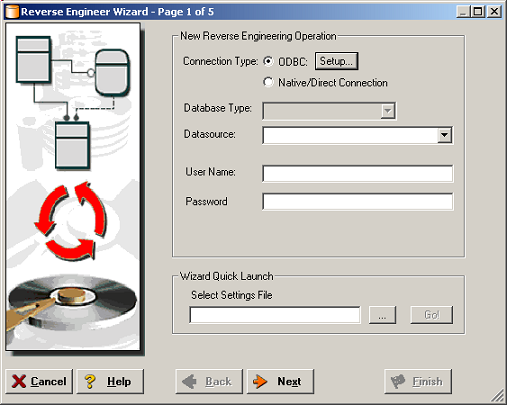 select "File | New" and in the "Create New Model" dialog select "Reverse Engineer an Existing Database" and click "Login"
select "ODBC" and clic "Setup..."
give a name to the ODBC source (say "my_access_odbc") and click "Select"
and click "Ok", "Ok", "Ok"
in the "DataSource" combo, select our new "my_access_odbc" datasource and click "Next"
Apparently Access has not much to offer, which is no surprise. But anyway, select "User Tables"
at this stage you can go to page 3 to 5 of the Wizard. In our case we decided to click "Finish"
As expected, displaying all the attributes makes this diagram difficult to read. We could restrict the display to the entity name only, as we explained previously. But then we would have to toggle between the simplified and the full diagram. There is a much better solution, which is to create sub-models. 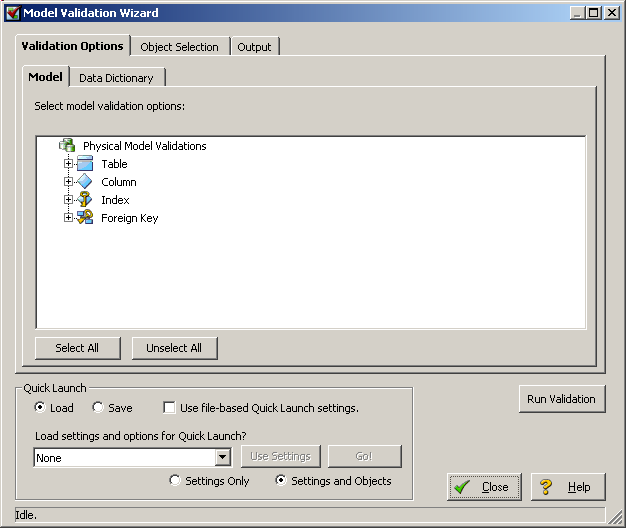 Sub-models are made of selected objects of the main model. We can work on the sub-model, but the neat part is that the modifications are synchronized with the main model. create the sub-model by selecting "Model | Create Sub Model"
type the sub-model name, say "orders_sub_model"
select "Format | Colors and Fonts"
select some item, say "Entity BackGround", then click "Set Color"
The models we handled so far were "logical models". Details specific to some specific database were not taken into account. ER/Studio can generate physical models, which are used to fine tune and optimize the design for some specific Sql Engine. 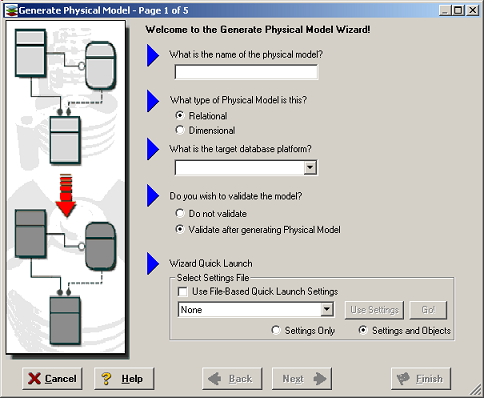 select "Model | Generate Physical Model"
set the "target Database Platform" to "Interbase"
the next Wizard pages allow you to set (physical) Indices, naming conventions, storage file name, ways of handling many to many relationships. 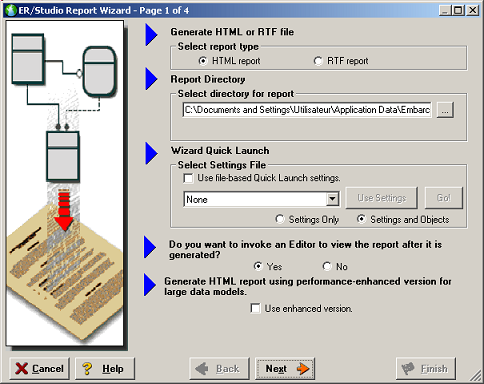 In our case, we simply clicked "Finish"
select "Select All" and click "Run Validation"
select "Tools | Generate Reports"
set the directory, select the type of report (.HTML in our case) and click "Next"
you can select other options, or like we did, click "Finish"
The report includes the attributes, indices, Sql script, where used etc. Exporting or importing meta data is quite easy, and with many possible meta data formats. 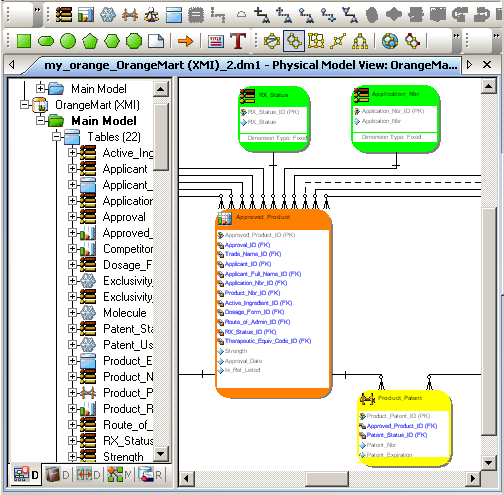 <XMI xmi="1.1" timestamp="Apr 12 2004 08:44:22"
This partial figure displays the start of the Product_Patent Table. 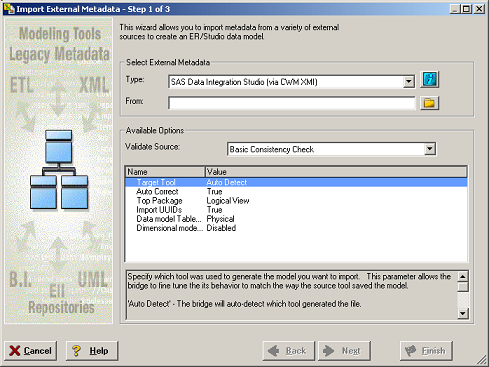 select "File | Import File | From External Metadata"
the import list contains a great number of formats, like Business Objects, CA, Cognos, Ibm DB2, Microsoft Sql Server, Oracle etc. Even Together ! 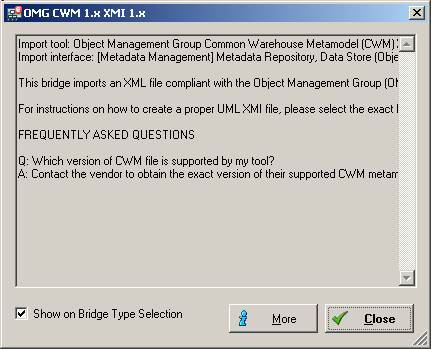 select "OMG CWM 1.x XMI 1.x"
Then click the "Open dialog" icon, and select "OrangeMart (XMI).XML"
Click "Next" (ER Studio version), "Next" (import log) and "Finish"
select one of the layout icons, say "hierarchical layout"
In Entity Relationship models, all entities are born equal. No Table looks more important, in some sense, than other Tables. 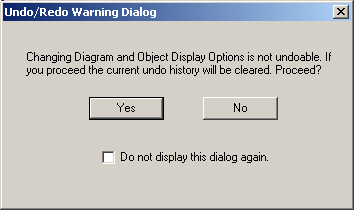 Therefore, the diagram often looks confusing to the user. the dimension tables, which contain the criteria which will allow the breakdowns (the "explanations" for the facts). There are some constraints on this Table classification (the facts must be numeric, the dimension tables must be linked to the fact tables by foreign keys), and also some freedom. In addition, the dimension Tables usually are not normalized. This is the "Star" model. And normalizing them will create a "Snowflake" model. 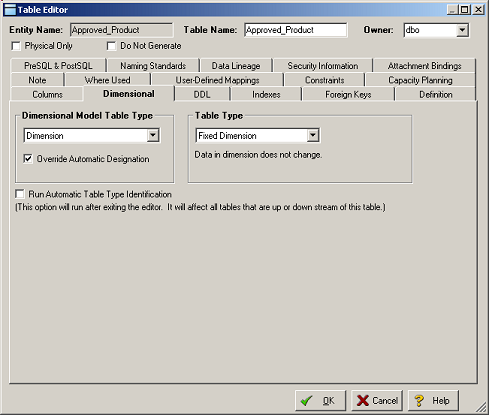 select "Model | Model Options"
select then "Model Notation > Dimensional"
Since the frame of each Table now includes an icon for the Dimensional type, there is a bigger frame around each Tableon the display, and some of the Table attributes have been hidden. You can display them by resizing the Table height. 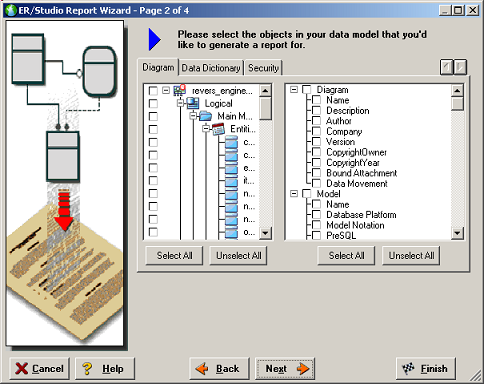 to concentrate at the central Tables of the diagram, we selected the "resize cursor"
the Fact Table has foreign keys for other Tables, which are therefore considered as "Dimension Tables"
the other Tables are "SnowFlakes Tables"
The left Diagram Explorer shows that there are several Fact tables. From a structural point of view, this is caused by the fact that several Tables have no children. It is also natural for a User to have serveral point of view. He might be interested in sales figures, but also in salaries, production quantities etc. To become a Fact Table, an Entity must conform to some rules (have numeric quantities, have parent Tables etc). But when several options are available, the overriding deciding factor is the User. He knows best which information he wants to analyze and which are the dimensions for breaking this information down. Therefore we can change the dimensional type of any Table. 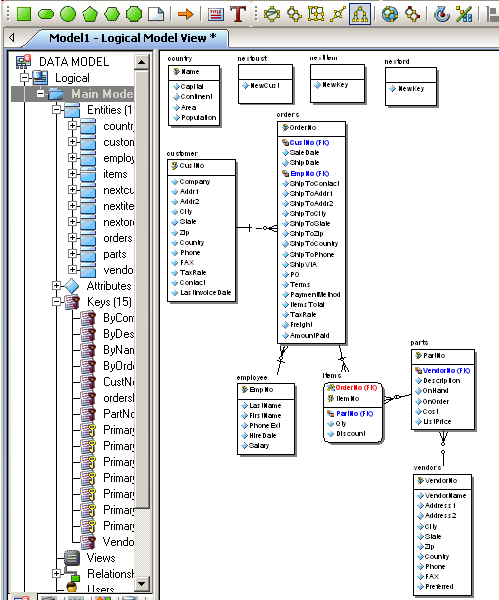 This Dimensional Model could then be used to build Mutli Dimensional Cubes or pivot tables. 8.4 - ER or Dimensional ? 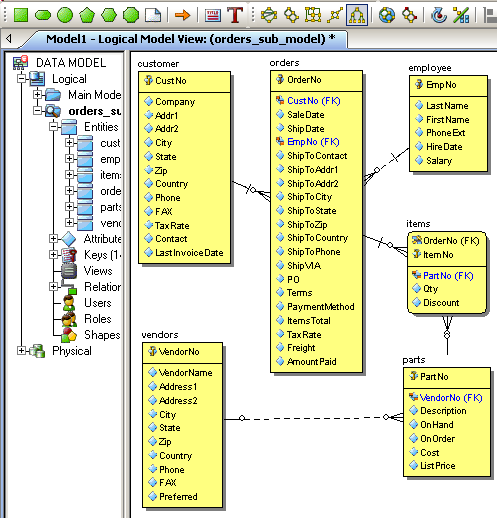 According to Ralph KIMBALL, the Dimensional model is a model equivalent to the Entity / RelationShip model, but much more understandable to the database users. ER/Studio can switch between both representations. 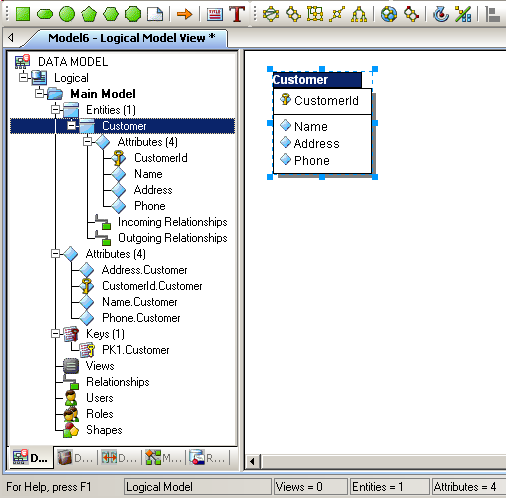 So it can be viewed as an Entity RelationShip Designer as well as a Dimensional Modeling Designer. For this very small tour of the product, we read once the QuickStart guide (half an hour), played with the Studio for about an hour, and then started to write this article, following the general plan of the QuickStart guide. We estimate that having thus spent half a day with ER/Studio gives us a reasonable feel for the product (and the company having created it). If you sometime used Model Maker, Together, Sparx System, you will be in business in no time. You will luckily now belong to the "Database Designer" folks, and are immediately entitled to a substantial salary raise ! the graphical possibilities are very complete. On the functional side, we only scratched the surface, but there are already many possibilities we could use. the demos include nice models which can be imported to have a better feeling of how to handle bigger databases. Of course, it is not because Embarcadero purchased Codegear that there will be a compulsory need to use or incorporate Embarcadero's tools within Delphi. Our presentation was mainly to get a feeling of this new company. 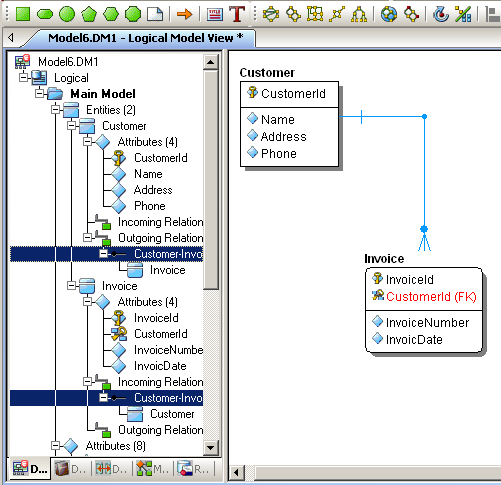 first it is a "full fledged UML tool"
with Delphi, it is mainly geared toward code generation and as ECO's first step. 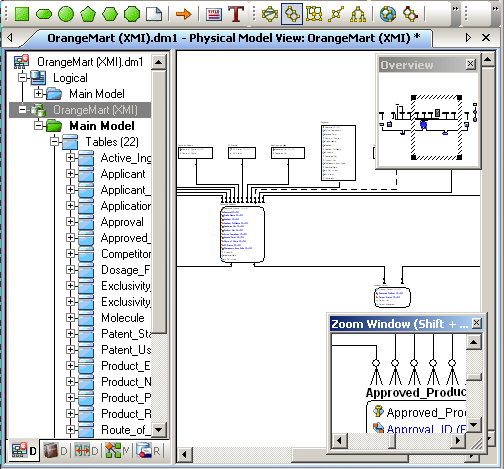 For object or Db analysis and design, we prefer to use our own simpler UML / ER graphical editor (which is used in most of our programming articles). So in the database design area, ER Studio could be a nice replacement. Right now, it is targeted toward big (many tables, big corporation) databases, but certainly can be used for less massive data volumes. 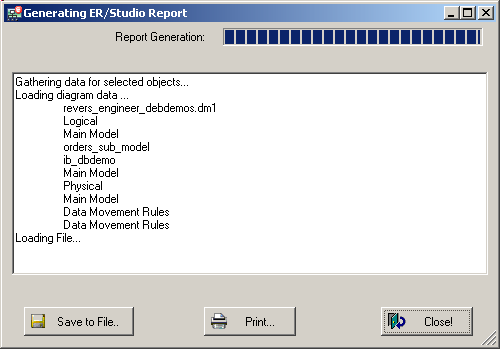 using ER Studio for InterBase could also be a good possibility. They already somehow include InterBase in their target Sql Engines, but not yet as a "first citizen" native Sql Engine, like they do for Oracle or Sql Server. Tiburon's roadmap first point stresses the drive toward improved database (dbExpress, DataSnap, multi tier). 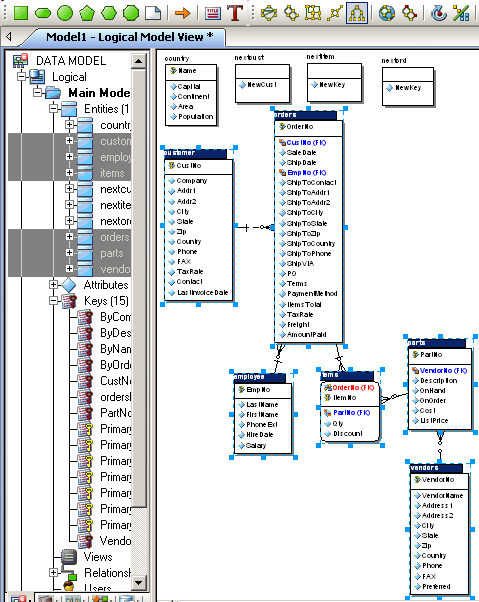 So design tools and Sql editors could become very handy. we welcome any comment, criticism, enhancement, other sources or reference suggestion. Just send an e-mail to fcolibri@felix-colibri.com. and if you liked this article, talk about this site to your fellow developpers, add a link to your links page ou mention our articles in your blog or newsgroup posts when relevant. That's the way we operate: the more traffic and Google references we get, the more articles we will write. Right after the announcement, there was a flurry of comments. Rumors said that Embarcadero's site was taken by a storm of visits (the home page was in fact quite slow, but the product and technical pages very responsive). Of course, everybody wanted to have a better understanding about the company we were going to get into bed with. Embarcadero and CodeGear, the blog from Greg KELLER, Embarcadero VP-Products at Embarcadero. A person very enthusiatic about the purchase. He and Nick HODGES (Codegear's Delphi Product Manager) were hunting the Web for comments about the purchase, and answering to many posts. Greg is also is a very responsive person. The sales was announce On May 7, we published this paper the 9 th and he kindly blogged about our article the very same day. Thank you Greg ! Sip From the Firehose Breaking news: Embarcadero Technologies agrees to acquire CodeGear from Borland - by David INTESIMMONE, VP Developer Relations, Codegear. 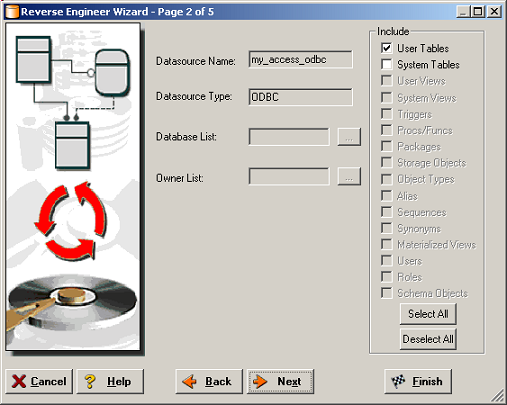 technical papers about Database Design. Felix John COLIBRI works at the Pascal Institute. Starting with Pascal in 1979, he then became involved with Object Oriented Programming, Delphi, Sql, Tcp/Ip, Html, UML. Currently, he is mainly active in the area of custom software development (new projects, maintenance, audits, BDE migration, Delphi Xe_n migrations, refactoring), Delphi Consulting and Delph training. His web site features tutorials, technical papers about programming with full downloadable source code, and the description and calendar of forthcoming Delphi, FireBird, Tcp/IP, Web Services, OOP / UML, Design Patterns, Unit Testing training sessions.